Are you building a new garage or renovating the older one? Do you love to have a soothing environment while doing some tinkering project or repairing your vehicle in the garage? Then you should get the help of some cool music that you love. It just needs good quality radio and speakers to listen to your favorite stations or songs. In my previous post, we have seen the best receivers for garage and workshop. 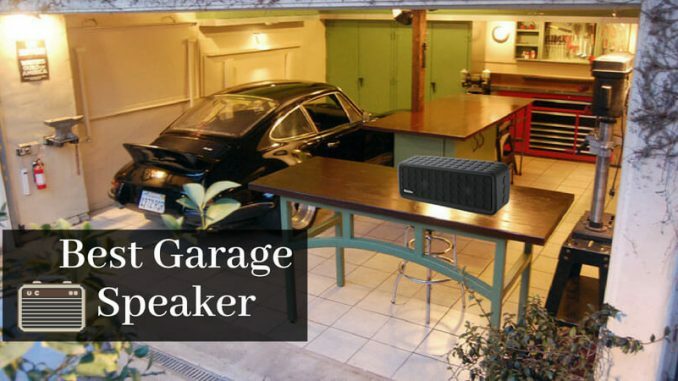 Today, we will have a look at the best garage speakers. Many people love to have the best garage sound system, but sometimes they get confused while picking up the most suitable products according to their budget and needs. Because there are a plethora of music systems out there in the market today, it can be challenging to pick the most suitable device. That’s why I filtered out the most sought speakers for garages and workshops here. Check them and get your perfect music companion to enjoy your work. 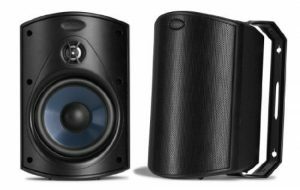 The LU43PB from Dual Electronics is a pair of speakers for indoor-outdoor use. So, whether you want to use them in the closed workshop or a full open garage, then you will not be disappointed after buying this amazing sound system. It is available in 100 Watt, 125 Watt, and 60 Watt output styles to choose from. With the 4-inch woofer, 1-inch cone, and 3/4-inch tweeter, you will get an amplified sound output whenever you play music through it. The ABS enclosure inside and the UV resistant coating outside make it completely weatherproof and great for patio use. You will get a one-year warranty from the company. Polk Audio is another famous brand for providing the best sound systems for indoor and outdoor usages. 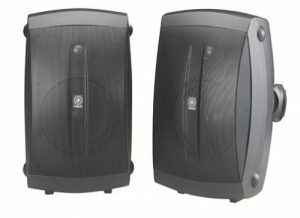 These Atrium series outdoor speakers are perfect for the outdoor usage like open garages and workshops. They are not only top rated for the build quality but also for their sonic sound performance in all weather conditions. The speakers have the industrial and military standard specifications to make them environment-friendly. 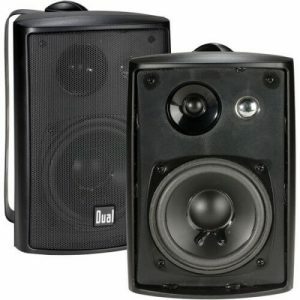 In this package, you will get a pair of two speakers which you can mount on the wall easily through a speed-lock system. Even though the speaker has a small design, it provides high fidelity for the quality of the sound. The speaker provides higher power handling with a smoother response due to the aluminum tweeter domes with the rubber coating. The baffle design helps to cover a wide area in the outdoor place. You will get the real sound output in high and low volume levels because of the top-quality material of the speakers. You can choose your suitable pair of speakers from two available colors and five different styles. 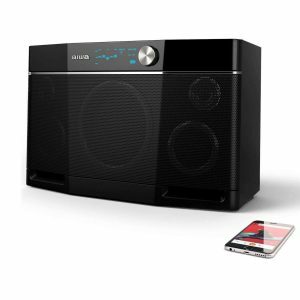 The Aiwa Exos-9 is almost the boombox type speaker that will fulfill your needs of a sound blaster indoor or outdoor. Due to its incredible loud output, you can use it even in the larger rooms and for the parties. You can connect multiple speakers to increase the area of the sound. It has 200 W power, five drivers, and a dual subwoofer to provide excellent sound output. After fully charged, it will deliver continuous performance for up to 9 hours. The five band graphic equalizer will help you to control the music by setting the bass and treble at high, mid and lows. It has a lightweight design which makes it extremely portable. You can take it anywhere with you. It supports Windows PC, Mac, iPhone, iOS, iPad, and Android devices. A 3.5mm audio jack allows you to connect it directly with the input system. You will get a 60-day money back guarantee and 1-year warranty from the manufacturer. The NS-AW350B two-way speaker from Yamaha is specially designed for the outdoor sound system requirement. 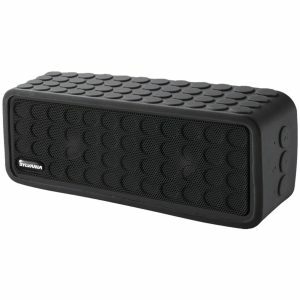 It is a two-way speaker that is versatile to work in both the front and rear positions. It will help you to create an immediate and convincing music environment anytime anywhere. You can choose from the two/four/six speakers bundles according to your requirements. 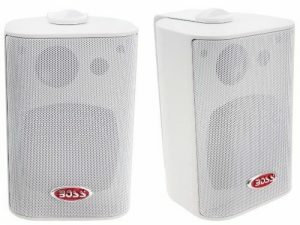 The speakers are available in two distinct colors including black and white. You will get the maximum power output of 130 Watts and 40 Watts at a reasonable rate. It will deliver clear and controlled sound thanks to its acoustic suspension build. The woofer has the high quality and compliance polypropylene material to provide a thrilling music effect. The speakers are water resistant, and you can mount them on the wall with ease. In the package, along with the speakers, you will get mounting brackets, speaker bases, a warranty card, and a user guide. Boss designed this 3-way indoor/outdoor speaker pair to provide you the desired sound output in your garage and workshop. This audio system can resistant in all kinds of weather due to its high-quality material and design. The cone is made from the polypropylene material, and the voice coil has 1-inch thick aluminum material. The swivel brackets allow you to mount and move the directions of the speakers. It has a 4 Ohms impedance, 85 dB sound sensitivity, and 80 Hz to 18 kHz frequency. You can choose from three different styles of the speakers. You will get a 3-year warranty from the manufacturer. The SP258 from Sylvania is a portable wireless speaker that will provide a sound blasting environment while you work in your garage or workshop. If you want to buy a garage speaker with excellent music quality at affordable rates, then this sound system is recommended for you. You can connect it with your iPhone, iPad, Android, or any other Bluetooth enabled device quickly & easily. It has a built-in handsfree speakerphone which will allow you to make hands free calling by using the microphone. Once you recharge it at full, you can play it for up to 8 hours continuously. The rugged design makes it damage proof from the accidental drop-offs. It also comes with a 3.5 mm headphone jack to listen to your favorite songs from the smartphones or tablets. It is excellent for offices, worksites, garages, and indoor usages. With the powerful sound quality and blasting output, the BTS10 wireless garage speaker from BW Distributions is also a great sound system you can go with. If you are a music lover who wants to listen to songs anywhere you go, then this lightweight and portable speaker will not let you down. It comes with two speakers with a 5W sound output from each to provide you with excellent music. It has IPX6 water resistant standards which means it is durable and can be used in all weather conditions. The 2200 mAh battery will allow you to play a regular 10 hours music at the highest volume. The wireless Bluetooth has a connection range of 33 feet which is quite impressive. You can even play songs from your Micro SD card or through the auxiliary cable. In this package, you will also get a USB to micro USB cable, an aux cord, and a user guide. 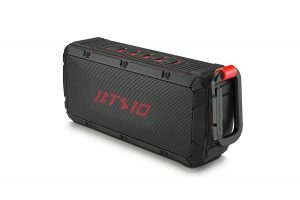 You can use it at garages, workshops, beaches, hiking, camping, and anywhere else where you want to listen to your favorite tracks. While choosing the best garage speaker, you need to consider some essential things. Check the sound quality, compatibility, wall mount ability, durability, warranty and price of the audio system you are buying. Keeping these things in mind, you can quickly pick your suitable speaker for the garage from the above list. Let me know your choice in the comments section below. If you have any other speaker in your garage or workshop which also works great and not mentioned in the list here, then also you can share your reviews on it here.